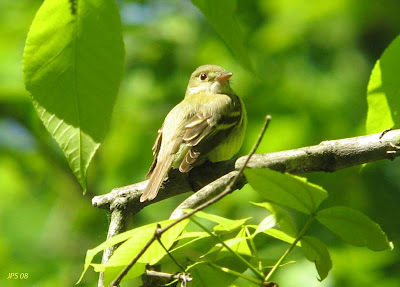 Acadian Flycatcher - This singing male was making the most of the sunshine on this rather cool day. Quabbin Park, May 28th. After yesterday's muggy conditions, today's cooler, clearer weather was most welcome. 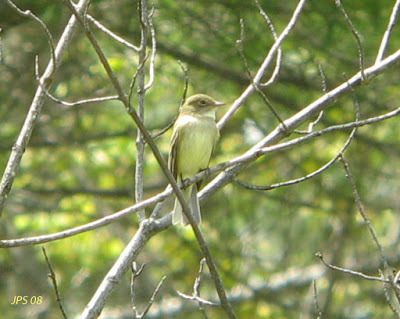 Highlight of the day was this Acadian Flycatcher returning for another summer in Quabbin Park. 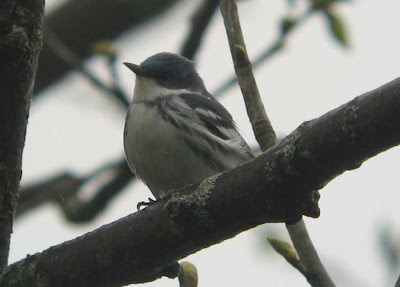 Alder Flycatchers are also more widespread now with birds at Ware, Hardwick and UMass, Amherst today. 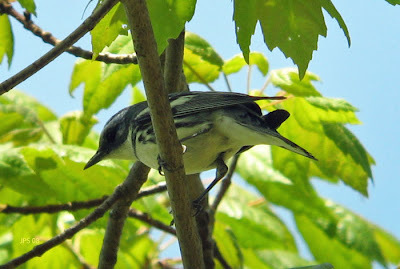 Also in Hardwick, a female Blackpoll Warbler (a male in Quabbin Park) and a singing Blue-winged Warbler. We still have hopes for more late season migrants. Mourning Warbler - male singing, October Mountain State Forest, Berkshire County, MA. Rather distant, poor quality digibin shot. Spent a most enjoyable day in the local area with visiting birding friends from the UK, Richard and Erica Klim. 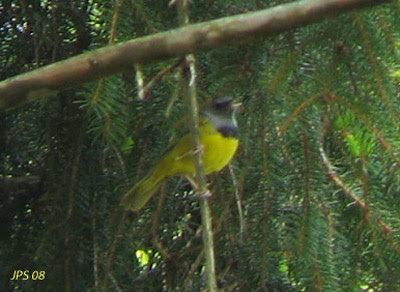 High on their wish list was Mourning Warbler, so we headed off to October Mountain near Lee, MA. The Mosquitoes and Black Flies were pretty fierce but it wasn't too long before we could enjoy good views of a male Mourning Warbler in a clear fell along County Road. Another bird was seen, with a further two heard singing. I found this to be a most interesting area with good numbers of species such as Winter Wren, Alder Flycatcher, Canada Warbler and a Golden-crowned Kinglet. Later we passed through Mt Tom near Northampton to enjoy Louisiana Waterthrush, and finished the day on the North side of the Quabbin with migrating Common Nighthawks, plus Eastern Towhee, Prairie Warbler and a fabulous display and chorus of Whip-poor-wills (about 4 in total). Special thanks to Richard and Erica. 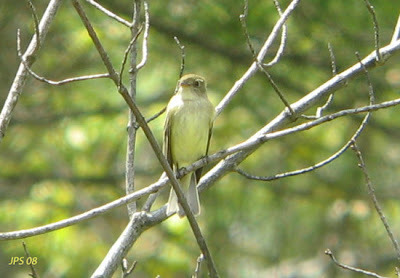 Alder Flycatcher - Central Quabbin, Franklin Co., MA. This bird wasn't singing but frequently gave a sharp 'pip' call, quite similar to the 'kip' of Western Kingbird. 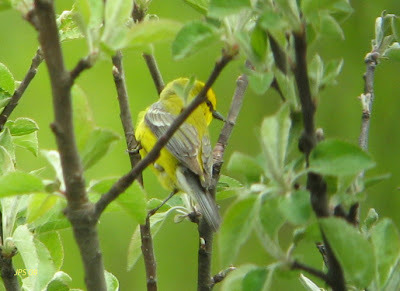 Blue-winged Warbler - Central Quabbin, Franklin Co., MA. May 23rd - Another fine morning in the Quabbin, though a little breezy at times. Pleased to see the Alder Flycatcher, my first of the year and about a week later than I usually find the FOY. The Blue-winged Warbler was singing an alternate song-type that kept me on my toes for a little while until I got a good clean look at him. Today (May 24th), 2 singing male migrant Blackpoll Warblers could be heard in Wildwood Cemetery, Amherst which are always nice to have locally. 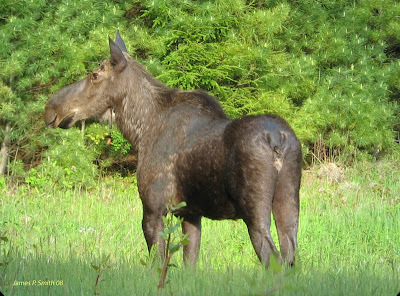 Moose - Central Quabbin, Franklin Co., MA. Highlight of today's late afternoon visit to the Quabbin. Didn't bird seriously today but a neighborhood walk produced a couple of feeding flocks, one in Wildwood Cemetery and one on North Whitney Street, Amherst. 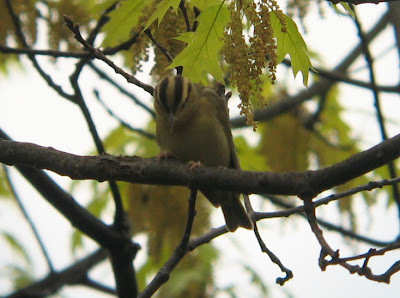 Both flocks contained reasonable numbers of Yellow-rumped and Magnolia Warblers, and apparent migrant Red-eyed Vireos with about 8 together in the cemetery. 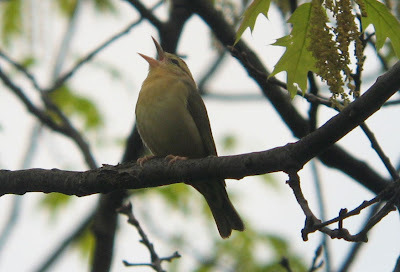 A Tennessee Warbler on North Whitney Street was the pick and my first locally this year. Bay-breasted Warbler - singing male, Quabbin Park. 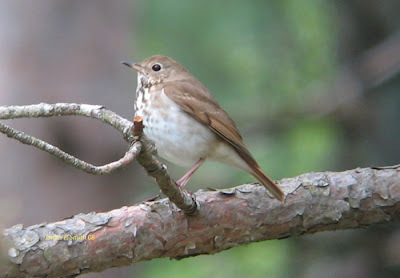 Hermit Thrush - Gate 29, Quabbin near New Salem, May 16th. Another morning spent searching for cavity nesters unearthed one or two interesting migrants in Quabbin Park though I must say, on the whole we seem to be stuck in a rather unproductive weather system for new arrivals. 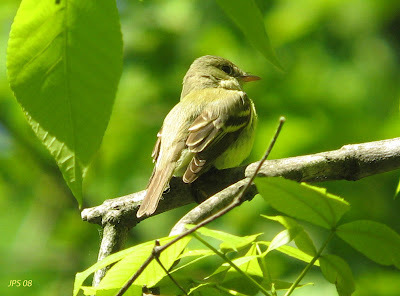 I'm a little surprised to reach May 20th without recording Alder and Olive-sided Flycatchers in the Quabbin area, but this morning I was pleased to have two Yellow-bellied Flycatchers close the entrance of Quabbin Park. 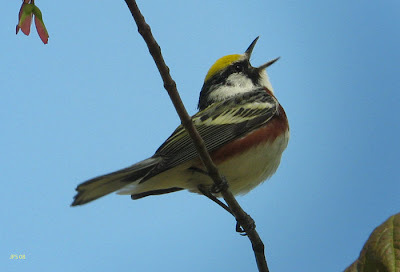 In the same area, I heard and then saw a handsome male Bay-breasted Warbler moving around with a couple of Pine Warblers, a Blue-headed Vireo and a Red-breasted Nuthatch. 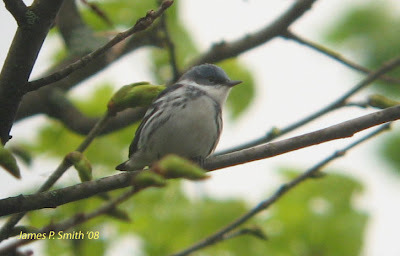 In the afternoon, a male Cerulean Warbler gave several bursts of song, perhaps raising the possibility of the return of this former breeder to Quabbin Park. Chestnut-sided Warbler - male, Central Quabbin. May 14th, 2008. Cerulean Warbler - male, Central Quabbin. May 14th, 2008. 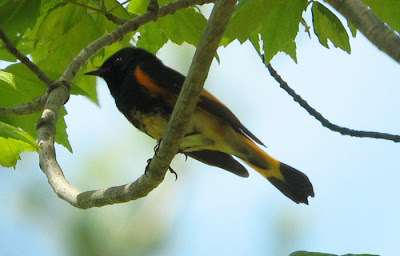 American Redstart - male, Central Quabbin. May 14th, 2008. 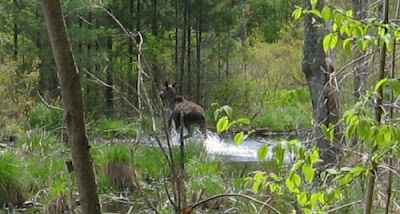 Moose - Central Quabbin. May 13th, 2008. Most of the last week has been spent in the Quabbin region. 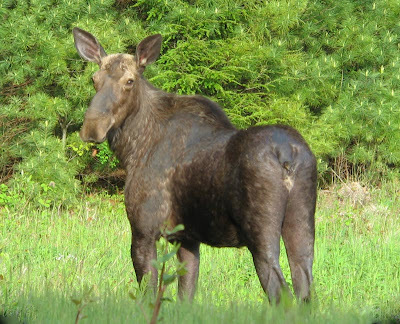 I've encountered some real gems especially the larger mammals, with 2 Black Bears together at Gate 40 on May 12th, and another on the Prescott Peninsula on May 14th, where I also got a quick snap of the above Moose. Birdwise it's been a mediocre week and an easterly airflow in the beginning of the week didn't produce as much as we might have hoped. 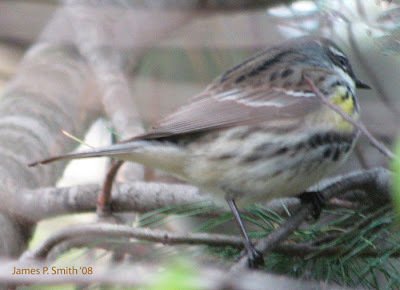 That much said a few boreal migrants have filtered through and I saw two Rusty Blackbirds in the Quabbin on May 13th, and Swainson's Thrush and Lincoln's Sparrow there on May 14th. 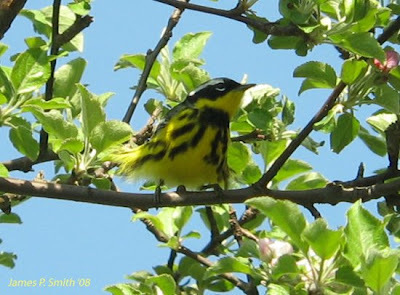 Gate 29 near New Salem has held most of the warblers with 12 each of Magnolia and Blackburnian Warblers on May 15th, along with singing Canada and Blackpoll Warblers. 'Drumming' Ruffed Grouse have also been audible on two recent visits to Gate 29 where I also found a nesting pair of Sharp-shinned Hawks which I think is quite good for the local area. Still much to look forward to with more North bound migrants to come. Well things are certainly moving along. 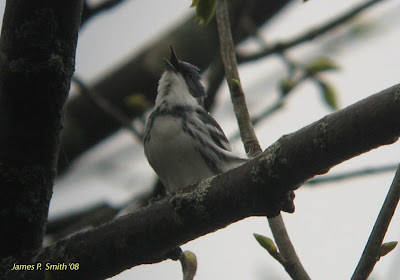 Only two days ago I noted my first Black-throated Blue Warbler of the spring, but today I heard multiples, and Susannah even had one singing in front of our apartment. After a couple of clear spring-like days, the rain bearing front that passed through Massachusetts overnight and into the day certainly left a lot of birds behind, and most of them were warblers. 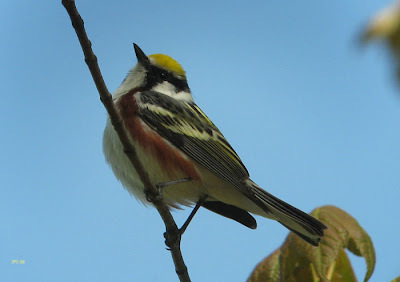 On the bike path at Amherst near Snell Street, a high feeding warbler flock contained some nice diversity including Blackpoll, Black-and-white, Black-throated Blue, Black-throated Green, Blackburnian, and Yellow-rumped Warblers, along with 10 plus Northern Parulas and a couple of Red-eyed Vireos. 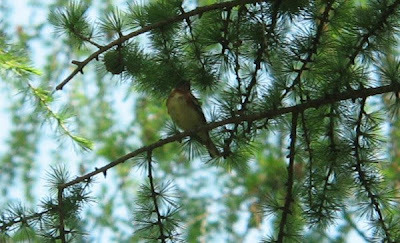 Great-crested and Least Flycatchers were present as well, and a Blue-winged Warbler sang from classic habitat further along the bike path. On short side trip to Skinner State Park on Mount Holyoke was most productive turning up the two 'hoped-for' key warblers, both of which were singing vigorously despite the gloomy conditions. The Ceruleans were most impressive with a total five seen or heard singing, including two males close to the upper parking area. 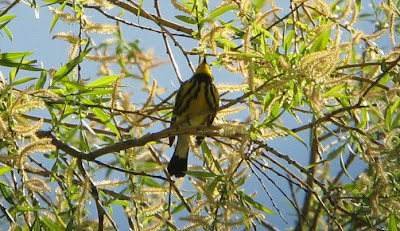 Lower down the slopes, three or four Worm-eating Warblers were audible including one that gave great views close to the road. About three Hermit Thrushes could be heard singing at this site too. Black flies are on the increase but it's still an absolute pleasure to be out. Select images from the last few days are included below. Magnolia Warbler - male, Winsor Dam, Quabbin, May 7th. 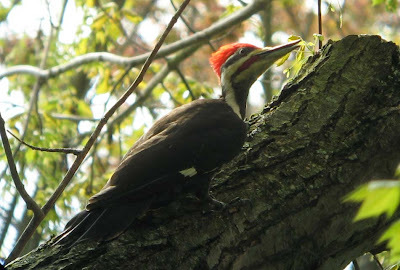 Pileated Woodpecker - Amherst Bike Path, Amherst. May 8th. Cerulean Warbler - Skinner SP, Mt. Holyoke. May 8th. One of five at this site. Worm-eating Warbler - Skinner SP, Mt. Holyoke. May 8th. 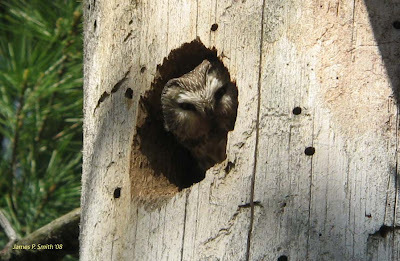 Northern Saw-whet Owl - Adult at nest. Hampshire County, MA. May 2008. 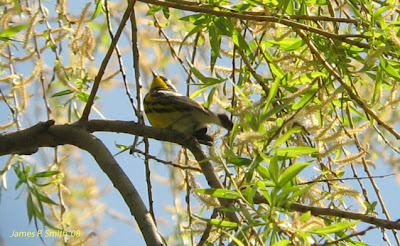 Magnolia Warbler - The first of the year, and always a thrill. Solitary Sandpiper - One of two on the Aqua Vitae road in Hadley. Black-throated Green Warbler - A decent wave of these today with at least 12 along a short section of the Northampton Bike Path. Singing Baltimore Orioles and White-throated Sparrows got the day off to a positive start on North Whitney Street, Amherst with further singing male orioles along the Connecticut River in Northampton near the Route 9 bridge. Spent much of the morning successfully searching for cavity nesting species along the Northampton bike path from Damon Street West to the railroad bed in Northampton. 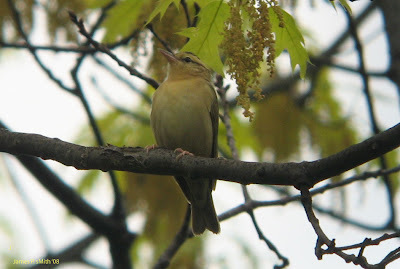 After two days of gloom, bird activity was high with many singing warblers towards the West end of the bike path. 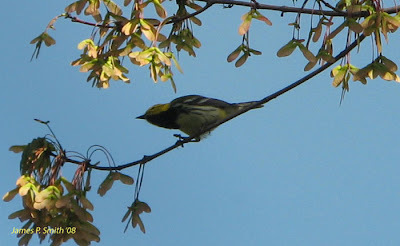 Most notably - 12 Yellow-rumped, 5 Nashville, 12 Black-throated Green, 2 Black-and-White, and a male Magnolia Warbler. At least 5 Ruby-crowned Kinglets were also singing, as well as Wood Thrush, Blue-gray Gnatcatcher, Warbling and Blue-headed Vireos and a rather nice male Orchard Oriole just where the bike path passes underneath I-91! A calling Least Flycatcher stayed high in the tops and was probably a migrant. 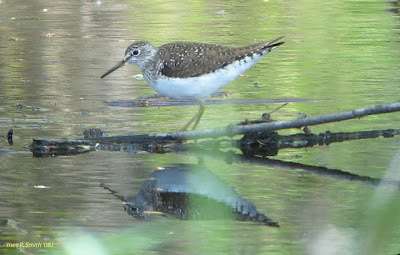 On the way home a couple of very quick stops, one at the Aqua Vitae road in Hadley, and one at Moody Bridge road in Hadley were both productive, with 2 Solitary Sandpipers and both yellowlegs at the former, and over 10 Bobolinks and a Brown Thrasher at the latter. Very cool indeed and all a beautiful spring day. Male Merlin, a migrant perched up by the Deerfield River, MA. The cold, damp conditions with some especially heavy overnight rain left me hopeful that five terns reported from Barton Cove, Turner's Falls yesterday might still be around today. No such luck. On my way out there I stopped very briefly by the road at Montague Plains hearing numerous Field Sparrows and Eastern Towhees, and made another quick stop at Turner's Falls airfield. At least five Field Sparrows were audible from the public parking lot, and a Killdeer was at the far end of the airfield. Dropping down to Barton Cove, the first couple of binocular scans produced no terns, so I gathered my scope to determine a couple of distant specks out in the main bay. A heavy looking, medium sized shorebird, already in flight as I approached the bank, gave an explosive call as it departed - Willet!! Realizing it was a very good inland record for Massachusetts, I watched with great disappointment as it headed South-East without showing any signs of returning. A brief check of the power canal didn't find it there either. 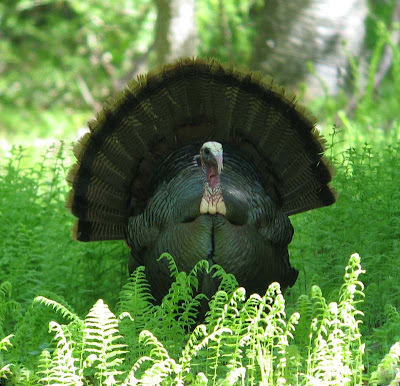 Veit and Petersen list just two inland records for spring (both in May) in the Birds of Massachusetts, and I'm sure I can remember Mark Lynch and Sheila Carroll reporting one from the Quabbin sometime last spring, again in May. Not too much else in the way of notable birds at Barton Cove, though a nice gathering of swallows over the water included over 300 Tree Swallows, about ten Bank Swallows and a Cliff Swallow among the five species present. Twenty Common Mergansers, 2 Green-winged Teal, 2 drake Wood Duck and a female Ring-necked Duck were also present. Further south, a short stop in Old Deerfield produced several Warbling Vireos and a nice male Merlin perched up over the river. 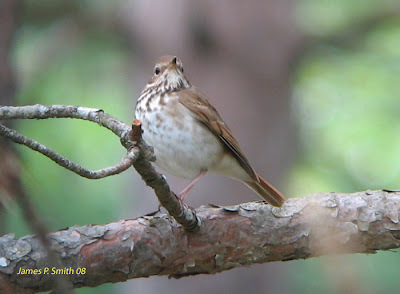 At home, on North Whitney Street, Pine Siskins and Yellow-rumped Warblers were still present in the area but a singing Wood Thrush this evening was new. 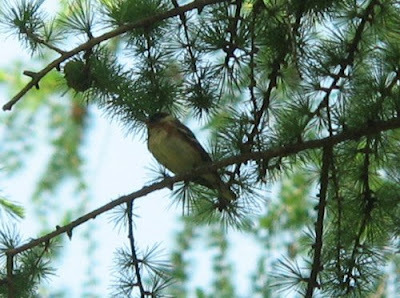 Yellow-rumped Warbler - Today's flock in the yard included some cracking males but all I ended up with was this poor shot of a female! Despite temperatures in the low 50s with constant rain and drizzle, it actually feels good to be back in New England after such a long spell away. Recent tours and time spent away, have all been very productive with periods in Arizona, Florida, Israel and Texas, but there's nothing quite like coming home to find out what's going on in your own backyard. This afternoon, a small wave of Yellow-rumped Warblers, maybe ten or so, moved through the bigger trees visible from our rear balcony. Two Eastern Phoebes fed surprisingly high in the canopy, with White-breasted Nuthatch, Downy Woodpecker, Blue Jay and American Robin making up a pretty nice feeding flock. Actually, today wasn't bad at all for 'yard birds' with a female Purple Finch seen well from the front window and a Black-and-White Warbler singing all morning. Also, and perhaps even better, my first Chestnut-sided Warbler of the spring singing just off North-East street in Amherst. Daily fare around North Whitney Street and Wildwood Cemetery over the last three days have been Pileated and Red-bellied Woodpeckers, Blue-headed Vireo, Red-eyed Vireo (today at least), Black-throated Green Warbler, House Wren and up to 8 Pine Siskins! Here's hoping for a few more updates during May and perhaps the odd trip summary.